And the Highest Ca$$h Price! Retire Your Ride is Canada’s top end-of-life vehicle scrappage program for both the environment and your wallet. 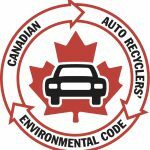 It’s the official national program, managed by the Automotive Recyclers of Canada. Only authorized Certified Auto Recyclers who follow a strict code of practice for handling end-of-life vehicles can participate. And we’ll have them bid on your vehicle to get you the highest cash price! Get more cash for your clunker today!